Painting of Shelton Bar by local artist Alf Wakefield. "If you watched long enough...a door would open in the mountain side and fire belched out just below the ridge where Shelton Bar nestles between the pitheads. This was the best train of all, wandering into the great black pit with neat little heaps of fire in the trucks along its length. When it got to the blackest end of the ridge, all tipped together and the hot slag poured like a bleeding wound." the view from my window"
In its heyday the works stretched across Etruria Valley to what is now Festival Park in Hanley. 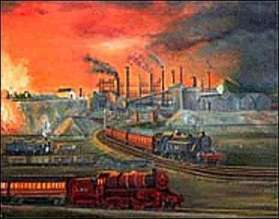 It had a 10,000-strong workforce, five coal mines, steelworks and rolling mills, blast furnaces and a bi-products factory. In 1964 Shelton was the worlds first steel plant using 100% continuously cast production.